Biren Kumar and his wife Swaran came from Fiji with nothing. Ten years on they are now running a successful CrestClean business. A couple who refused to let cruel thieves ruin their dream to move to New Zealand are celebrating 10 successful years with CrestClean and now own a six-figure business. They’d saved hard for a new life in New Zealand when all their money was taken along with cash they’d just made from a sale of their possessions. They were heartbroken, the theft shattering their hopes. A family member ended up paying their air fares so they could travel to Auckland. 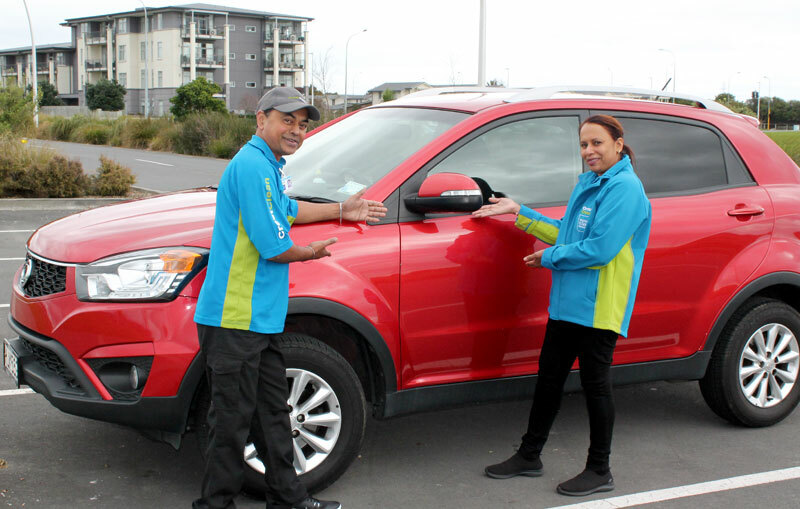 After moving to New Zealand Biren and Swaran bought a small CrestClean franchise and worked tirelessly to get ahead. They’ve tripled the size of their business, the guaranteed regular income from CrestClean giving them the confidence to buy a home for themselves and their two children. Their new life here is a world away from how it was in Fiji before they left, a time Biren frequently remembers. “When you are successful you have to look back to appreciate where you’ve come from,” he says. It was in 2008 that Biren and Swaran’s dream of moving to New Zealand was dealt a cruel blow. The couple and their two young children were preparing to leave Fiji when thieves struck less than a week before they were due to fly out. Following a garage sale, burglars entered their home and grabbed $10,000 in Fijian dollars. All their savings were taken, including money they had made from the sale. Help came from Swaran’s sister in Auckland, who paid for the family’s air fares to New Zealand. In Auckland the couple found work on a production line at a plastics factory. But with Biren working days and Swaran on the nightshift, there was precious little family time left to spend with their children. The breakthrough came when a family relative, Rajju Prasad, offered the couple some part time cleaning work. Biren enjoyed the work and Rajju, who has a CrestClean business, suggested he should buy a cleaning franchise of his own. He offered to be a guarantor for the couple, paving the way for them to secure a $36,000 bank loan so they could purchase a small franchise. It was the break they needed. Biren and Swaran set themselves a target to repay the loan within three years. “We somehow managed to do that. It was a miracle, God was with us,” says Biren. “You just have to have faith in yourself and never lose hope. As their business grew, they managed to move up the property ladder, selling their three bedroom house in Alfriston to buy a larger property in Mangere. Biren says he loves his job. “I’m very proud to be a cleaner because we are the ones who are keeping New Zealand clean. CrestClean’s Managing Director Grant McLauchlan said it gave him a lot of personal satisfaction to present Biren and Swaran with their long service award. 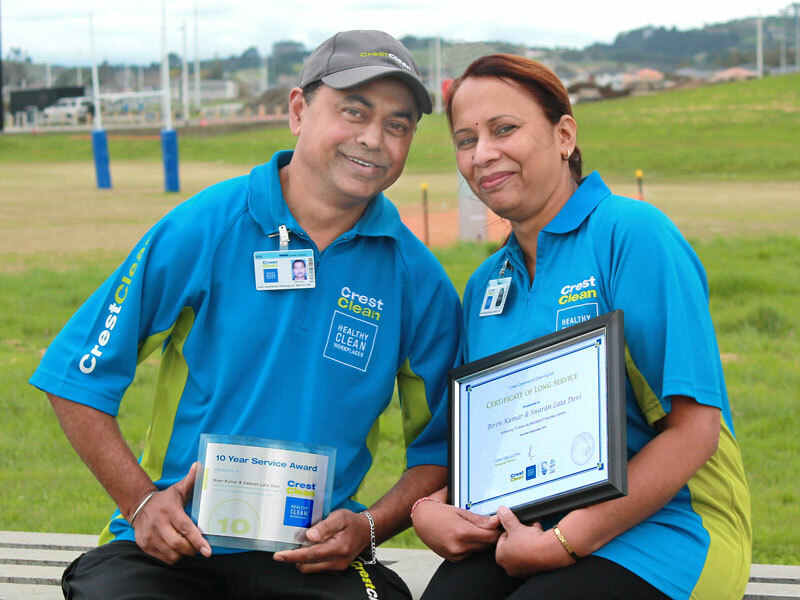 Viky Narayan, CrestClean’s South Auckland Regional Manager, says Biren and Swaran are a great team and very popular with their customers. To mark their 10 years with CrestClean, the couple received a $2,500 long service bonus from the company. They plan to celebrate by taking a well-deserved holiday. “We’ll take a break and probably have a nice holiday to Singapore,” says Biren. Biren and Swaran have just purchased a new car – a SSangyong Korando.